Our sources had already hinted at a possible Father’s Day release of the Motorola Shadow (Xtreme? 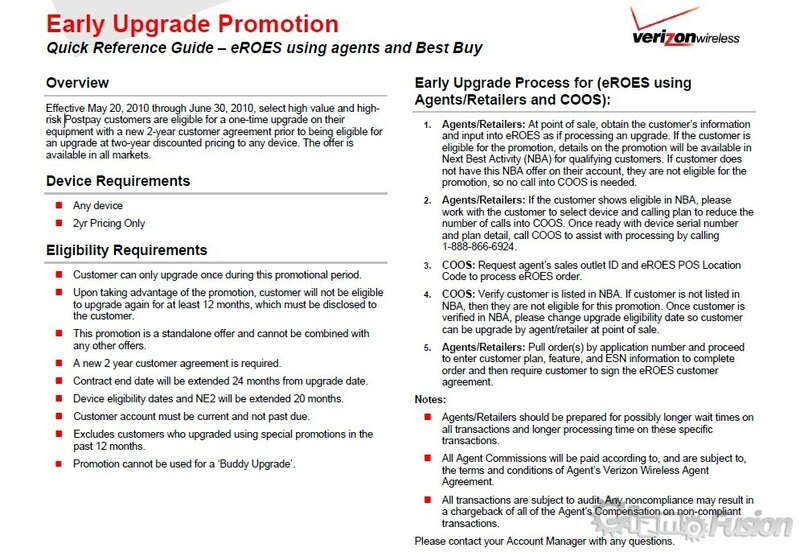 ), so this new rumored Verizon early upgrade promo doesn’t just seem like a coincidence. Running from May 20th through June 30th, you’ve got to think Verizon is hoping to push something new especially after seeing thousands of customers use their early upgrades on the Droid Incredible. Maybe? This could really just have a lot to do with the new iPhone which is supposed to drop sometime in June on AT&T. What better way to help combat that release than by allowing existing customers the chance to get shiny new phones while also locking them into 2-year contract extensions. Cha ching. That article is for stores only, and shows it is for only high risk customers, which means this is a save option only, not for everyone. High value customers doesn’t really mean much, there is nothing that specifically states whether someone is high value or not. I’ll just say this then…come May 20th, you might as well ask about this promo! Who knows, you may be a “high risk” or a “high value” customer, right?